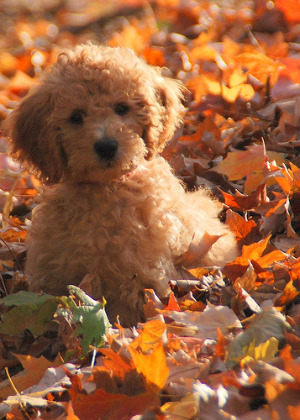 The Labradoodle originated developed in Australia. They was developed between a crossed with a white Standard Poodle and a yellow or black Labrador retriever, and these makes Labradoodle. They were developed to used as companion dog and service dog, they were bred for those whose allergic to dogs. The Labradoodles has three different varieties of size, which are standard, medium, and miniature with two different coat types (fleece and wool). Both coat types are non-shedding and allergy friendly. This dog breeds is little to no shedding. They is very bright and intelligent dog. They are always eager to learn, and it is very easy to train. Training should be structured, yet fun to keep this dogs attention. And they is easy to housebreak. The socialization training should start from a puppyhood to give them get along well with other dogs. The training should train with firmness, fairness and must be consistency. They can do very well in agility sports and in many different sports. The Labradoodles is known as non-shedding dog breed and hypoallergenic dog breed. Most dogs do have a lush coat that needs brushing and combing two or three times a week to prevent matting or tangling. They shed less hair so brushing is extremely important. Bathe and dry shampoo when is necessary. Regularly check and clean on their eyes and ears. The Labradoodle is very easy to train dog breeds and is very intelligent. They make a good watchdogs. They is specially design for those allergies to dogs. They can get along well with children and other dogs if properly trained. They is a very good companion dog.